Pembe the Huthiq always dreamed of being an all powerful fairy in Nimbus. She escaped from Enipah to follow her dreams, but it did not go as planned; She got lost along the way and now lives in the Foxfire Forest as a pixie. While she has no powers to call her own, she does have a pair of magical dice she found in her travels. Feeling lucky? 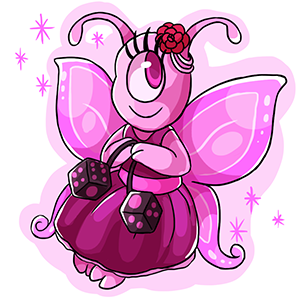 For only 1,000MP you can borrow my enchanted Pixie Dice once every 16 hours to throw at one of your pets.